The workspace consists of a toolbar on the left, stage in middle and a menubar at the top of the stage. Drag and Drop - The workspace relies heavily on dragging elements from one location and dropping them into their desired position within the stage. When the mouse cursor is over an element that can be dragged the cursor will change to an open hand . While dragging elements over the stage the nearest drop location will be highlighted by a dashed bordered . Tip: When inserting or repositioning elements you should always make sure a drop location is indicated on the stage before dropping. The toolbar located on the left side of the workspace contains several draggable tiles. Each of the tiles can be dragged from the toolbar and dropped onto the stage. Placing a tile onto the stage creates a new element for your mobile site. 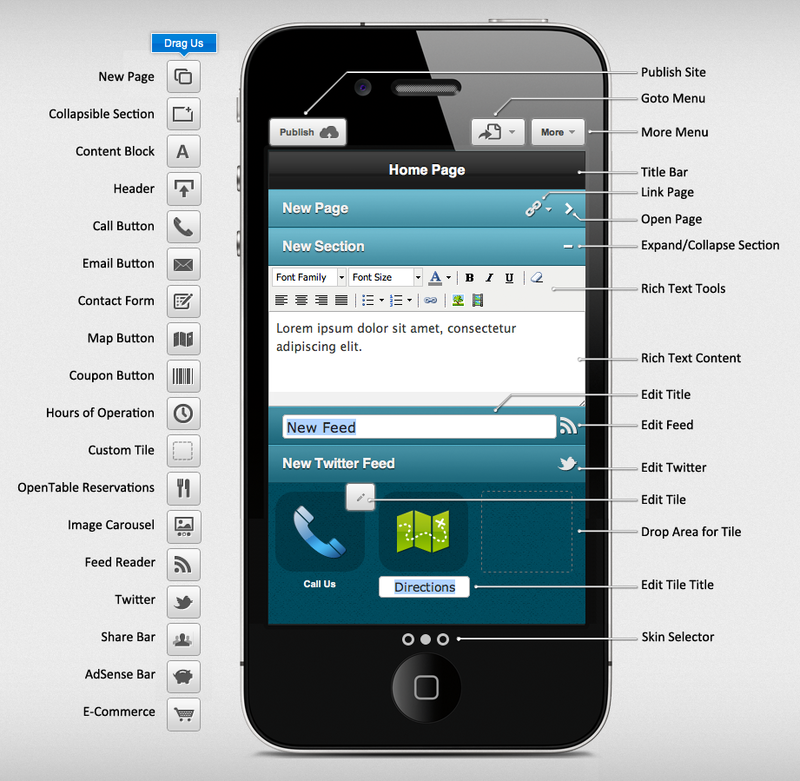 The stage area is where you arrange and edit all of your mobile site’s content. Content can be arranged by dragging elements to their desired position. Most	elements	will auto-open the editing dialog box when dragged to the stage. The Publish button will make your site available on the Internet. The first time you publish you’ll be prompted to choose a subdomain, which visitors can use to view your site. Tips: After publishing, skip the need of manually typing your new site address into your smartphone by using the “Email me a Link” feature. Change your subdomain in the Site Settings dialog. The Goto menu provides a quick way to open existing pages, delete and rename the current page, or create a new page. Warning: After a page has been deleted the page and its content cannot be recovered. SiteStyles are an easy way to dramatically change the look and feel of your entire site. Each SiteStyle consists of a color coordinated palette, buttons, and tile icons. see: How do I change the look and feel of my site? Site Title: Choose a brief name for your site that will be combined with each page’s title and displayed in the browser’s title bar or when a page is bookmarked. Site Description: Provide a brief (150-160 characters) summary of your site to be displayed on search engines results pages. Subdomain: Choose an address for visitors to go directly to your mobile website. see: How do I change where my site publishes to? Redirect snippet: Automatically redirect smartphone visitors from your desktop site to your mobile site. 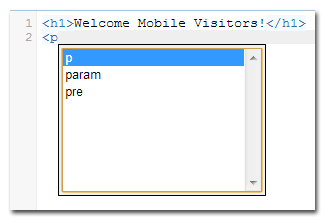 see: How do I redirect smartphone visitors from my desktop site to my mobile site? Return to Desktop Site Button: Select this option to include a button that returns your visitors to your desktop site. QR Code: Click the QR Code image to download a print quality version. This image can then be used on flyers, brochures, business cards, etc. When someone scans the QR Code with their smartphone they will be taken to your mobile site. After your site has been published for a few days you’ll be able to generate site traffic reports. The report is filtered by date range and traffic data analyzed across five categories. Visitors: Two line graphs display unique visitors plotted over a date range. The smaller and secondary line graph can be used to zoom in on a specific timespan. To zoom in click and drag across the secondary line graph, releasing at the end of the desired period. New vs. Returning: Use this pie chart to easily compare the number of visitors coming to your mobile site for the first time versus your repeat visitors. Traffic Type: This pie chart categorizes traffic into Direct (using your site’s address), Search (found on search engines), Campaigns (search engine Ads), and Referrals (other websites). Most Viewed Pages: If you mobile site has multiple pages they will be ranked by the number of visits on this list. Top Keywords: When traffic comes to your site from search engines the search term used to find your site is saved and ranked on this list. Manage your contact email, password and subscriptions. Email Address: This address is used to sign in to the app and for any notifications. When changed a new verification email will be sent out. To validate the new email address please follow the instructions included in the email. If you do not receive the verification email within an hour please check your spam folder and verify the spelling of your new email address. Password: Your password is a secure word or string of characters used to sign in to the app. Your password is stored with encryption using the most stringent security guidelines. For your additional security it is highly recommended to not use any password more than once. Do not reuse the same password you have used for your email accounts, financial services, computer, etc. Manage the your subscriptions and billing information from the Subscriptions dialog. You can switch the live preview for your mobile site by selecting from Android, iPhone, or Windows Mobile skins. Click between the skins using the Skin Selector buttons. Your skin will immediately update. An easy way to add a new page is to create a link from your current page to your new page. From the toolbar drag a New Page tile onto the stage. This will create a new bar on stage that will link to your new page. Click the right chevron icon located on the right side of the bar to open your new page. Notice the new page includes a Header with a title of “Untitled #”. You can now edit the page’s title add new content. Alternatively you can add a new page from the Goto menu, however a link to the new page will need to be manually created. Links to pages can be created from the Rich Text Editor or a new page bar’s Link to page menu . Group content into regions that can be selectively collapsed into a single row to with Collapsible Sections. This element is used to efficiently utilize the limited screen space available on mobile devices. From the toolbar drag a Section tile onto the stage. By default new sections are expanded so that content can be added. To collapse the section click the collapse button in the upper right corner of the section. Tip: Sections can only contain rich text blocks, images, video and button tiles. Nesting collapsible sections, pages or other bar-like elements is not permitted. Content blocks are the most common tool you’ll use while building out your mobile site. Content blocks can contain elements such as text, images, lists, video and links. From the toolbar drag a Content tile onto the stage. Content blocks have their own toolbar. Alternatively you can create a new content block by clicking inside an empty collapsible section or page area. When the mouse cursor is over an empty area where this is possible the cursor will change to a text caret . NetObjects Mosaic utilizes Smart Cut & Paste technology to intelligently format and display pasted content. This feature has many uses, for instance, a user can copy portions of their desktop website and paste directly into a Content Block. Mosaic will calculate and cleanup the formatted code, scale and optimize images appropriately for a variety of mobile device screen resolutions. The second set of tiles in the toolbar allow you to add compact UI elements to your mobile site. These tiles can be arranged into grids of up to 3 columns on a page or nested inside of collapsible sections. Each tile acts like a mini-app designed to compliment a specific feature. Call Button - Launch the smartphone’s dialer app. Email Button - Launch the smartphone’s email app. Contact Form - Survey visitors and have the results emailed. Map Button - Launch the smartphone’s mapping app. Coupon Button - Generate QR codes that can be scanned as coupons. Hours of Operation - Display your store hours in a popup. 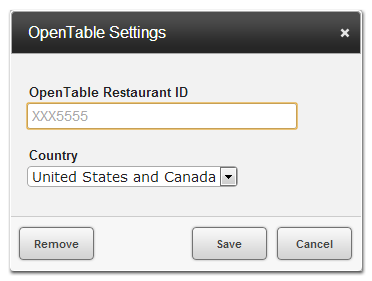 OpenTable Reservations - Gives visitors the ability to reserve a table at your establishment. Image Carousel - Create striking carousel photo galleries. Custom Tile - Create a button with your own icon. Drag the desired tile from the toolbar onto the stage. The tile will auto-open the editing dialog window. It can then be edited manually by moving the mouse cursor over the tile and then clicking the edit button in the upper right corner. You can also edit a tile by double clicking on it. The tile’s label text can be edited by moving the mouse cursor over the label until the cursor changes to a text caret , then clicking. The header bar displays both the page’s title and site navigation controls. Each page can only have one header placed at the top of the page. Drag the header tile from the toolbar to the top of the stage. Tip: If a page already has a header then the tile will not be visible on the toolbar. The third set of tiles in the toolbar allow you to integrate your mobile site with 3rd party services such as Twitter, Google Adsense, Flickr, Facebook, and many others. When one of these tiles is added to the stage it is represented as a bar occupying a single row of content on the page. Feed Reader - Popular sites, blogs and social apps offer content syndicated as a RSS/Atom feeds. Using their feed URLs 3rd party content can easily be integrated into your mobile site. Depending on the feed’s content a distinct layout out will be applied. For example Flickr feeds are published as photo galleries. Some example feeds are provided in the editing dialog. Twitter - Automatically have you or any other user’s tweets replicated on your mobile site. Share Bar - Promote your social media accounts by letting users follow you on Twitter or like your FaceBook page. Even you don’t have any social media account you can still let your visitors promote your mobile site via their social services such as FaceBook, Twitter, Google+ and email. Google AdSense Bar - Earn money by placing Google AdWords ads on your mobile site. 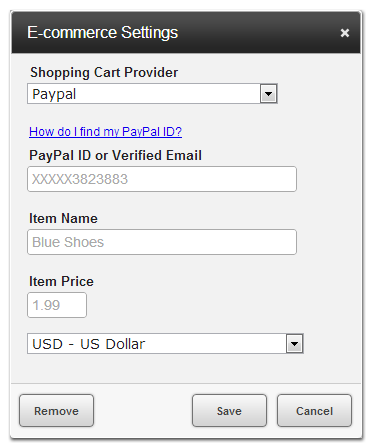 E-Commerce - Sell your products and services with options for Google Checkout or PayPal. From the toolbar drag a tile onto the stage. Edit the bar’s settings by moving the mouse cursor to the far right side of the bar and then click the edit button. Each edit button icon , or corresponds to the type of bar. The bar’s title text can be edited by moving the mouse cursor over the title until the cursor changes to a text caret , then clicking. Warning: Use caution when removing content as it is typically irreversible. Any content that you remove from the stage will not be removed from your live site until the next time you publish. Deleting a page will remove all of the page’s content as well as any page bars linked to that page. Select the page to be deleted from the Goto menu . From the Goto menu click Delete Current Page. When prompted click OK to complete the deletion. Tip: Removing a page bar does not delete the page that the bar is linked to. Use caution when removing a collapsible section, they often contain additional content such as buttons, text or images. Move the mouse cursor over collapsible section. Click the remove button that appears on the left side of the bar. Move the mouse cursor over the rich text content block until the cursor changes to a text caret . Click on the content block to launch the rich text editor. Select all (Ctrl+A / ⌘+A) of the content and then press the Delete key. Click outside of the rich text editor to close the rich text editor and complete the removal of the content block. Button tiles can be removed in two ways. Firstly simply drag the tile outside the boundaries of the stage. Alternatively click the Remove button from the tile’s settings dialog. Twitter, Google AdSense, pages, headers, collapsible sections, feed reader and the share bar all have a remove button that appears when the mouse cursor is over the element. A page bar’s title and linked to page can be edited. Move the mouse cursor over the page bar’s title text until the cursor changes to a text caret . Click on the title text to launch the inline title editor. Update the title text and then press the Enter key or click outside of the title text editor. Changing which page the page bar links to. Move the mouse cursor over the page bar revealing the Link to page menu . Open the Link to page menu and select a new destination for the page bar. A collapsible section’s title text can be edited as well as additional content nested inside the section. Nesting content inside a section. Simply drag the desired button tile or content block from the toolbar onto the stage. Tips: Alternatively tiles and content blocks already on the stage can be dragged into the collapsible section as well. Launch a content block’s rich text editor by moving the mouse cursor over the block until the cursor changes to a text caret . Then click on the content block. 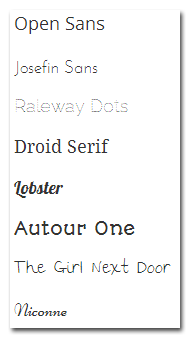 The Content Block editor has 8 custom web fonts available for your use. Utilizing custom fonts brings a deeper level of creativity to your design. You can add or edit your own HTML using the Edit Source Code button, . When clicked, the Code Editor appears with the following options. Tip: The HTML editor accepts valid HTML and XHTML code. 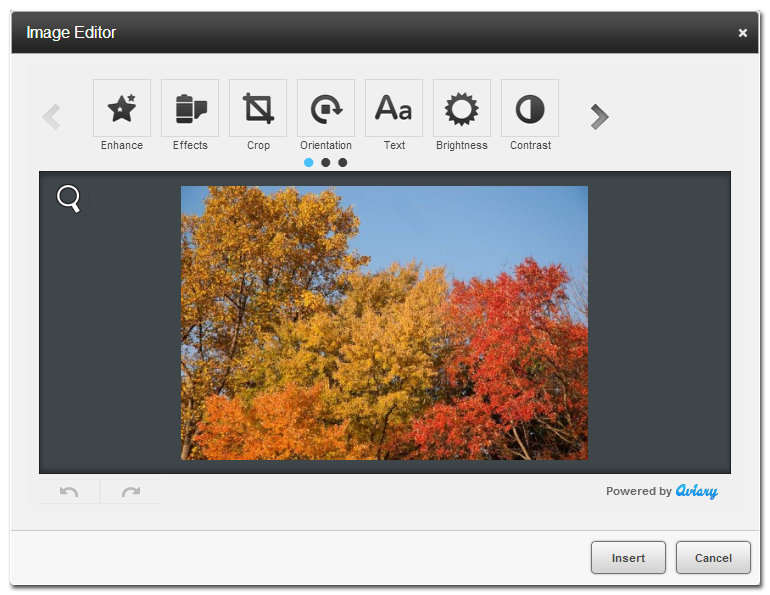 Utilize the Built in image editor (powered by Aviary) for a comprehensive suite of effects and tools. For a list of available tools, please look below. Edit tiles by moving the mouse cursor over the tile and then clicking the edit button in the upper right corner. You can also edit a tile by double clicking on it.The tile’s label text can be edited by moving the mouse cursor over the label until the cursor changes to a text caret , then clicking. How do I redirect smartphone visitors from my desktop site to my mobile site? How do I change the look and feel of my site? How can I create a Custom SiteStyle? How do I check my site’s traffic? How do I change where my site publishes to? How do I create a link that prompts a mobile visitor to send me a text message? How do I sell my products or services through my mobile site? How can I provide my visitors a way to reserve a table at my restaurant? How do I create a carousel photo gallery? Do you have an affiliate program and where do I sign up? How do I navigate the Affiliate Portal? How do I use my referral codes or place my sign up widget? From the More menu launch the Site Settings dialog. Copy snippet of code from the “Redirect Smartphones to Your Mobile Site” field. Paste the snippet in between the HEAD tags your desktop site. Save and publish the changes to your desktop site. Requirements: You must have access to add or edit the code of your desktop site. If you can’t paste the code in between the HEAD tags that's ok, just try to insert the snippet as close to the top of the page as possible for the best performance. Slowly move the mouse cursor over each SiteStyle family. Notice the first color variation of each SiteStyle family is previewed on the stage. Most SiteStyle families contain several color variations, each selectable from the family’s submenu. When you find a style that you like click the corresponding menu item to apply it. Tip: You can always revert back to your previous theme just simply find the old SiteStyle and reapply it. Changing SiteStyles is non-destructive to your site’s content, so feel free to try out several styles. 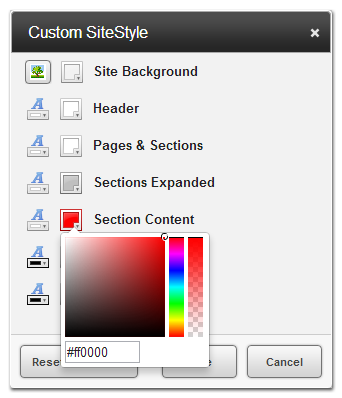 Alternatively you can create your own SiteStyle with custom colors by selecting the “Custom SiteStyle...” menu item. From the More menu mouseover the SiteStyles submenu. 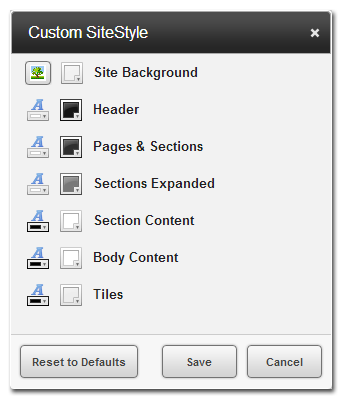 Select the Custom SiteStyle submenu item. The Custom SiteStyle window appears. Site Background – The background of your mobile website—you can use an image, color, or a combination of both. Header – Each page has the option to use a Header at the top of the page. Pages & Sections – The bars for different pages and sections. Sections Expanded – Active bars for sections. Section Content Background – The background color of a Section—Can also utilize transparency. Content Background – The background of a Content Block—Can also utilize transparency. Tiles – The various Button Tiles such as the Call Button and the Coupon Button. Text Color - To the left of each element there is a color selector to edit the text color. Tip: Your custom SiteStyle Background can use an image, color, or a combination of both. To select use an image, select the Image icon . The Browse Window appears, locate the image you would like to use and select it and then click Open. Tip: You can also double click the image in the Browse Window. If an image is 365px or below, Mosaic will automatically tile the image for a seamless background. If the image is 366px or larger it will stretch to fit, keeping the aspect ratio. Both the Section Content Background and the Content Background can utilize transparency on the color selected. To adjust transparency, select one of the two transparency enabled elements. To the right of the Hue slider is the transparency slider. Slide up to decrease transparency, slide down to increase it. Once your adjustments are complete, click Save. The Custom SiteStyle is automatically applied. From the More menu launch the Site Analytics dialog. 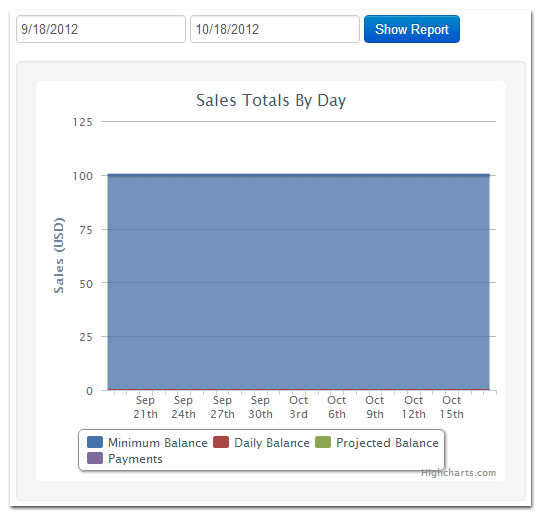 Use the two date picker fields to set the date range and then click the Update button to refresh your site’s analytics. Requirements: Make sure your site has been published for at least 3 days. You can even visit the site yourself to generate some vanity stats. From the More menu launch the Site Settings dialog and locate the “Free Subdomain” section consisting of two fields. In the text field replace the “default-##” text with your desired subdomain. The subdomain must only contain alphanumeric characters and dashes. From the drop-down field choose one of the predefined domains to pair with your subdomain. From the More menu launch the Site Settings dialog and locate the Site Domain(s) section. Click the “Use an existing Domain” button. Enter a domain that you own. Tip: You can use multiple domains by entering them as a comma separated list. Tip: Each carrier has their own sms address, you can generally find them from your carriers help section. Select the text you would like to link in your content block by highlighting and selecting the link option . 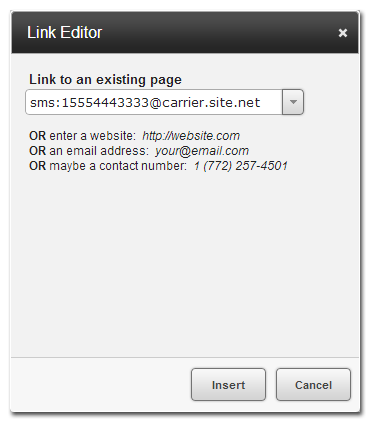 In the link dialog box, type in the sms address you wish visitors to contact you through. The users phone will open the default texting application with your address pre-populated. Drag the E-Commerce tile, , onto your Stage to provide mobile visitors the ability to purchase your products with PayPal or Google Checkout. 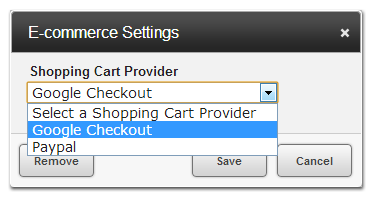 The E-Commerce settings window appears. Select your preferred Provider. Once you have selected a Provider, fill out the fields that appear. 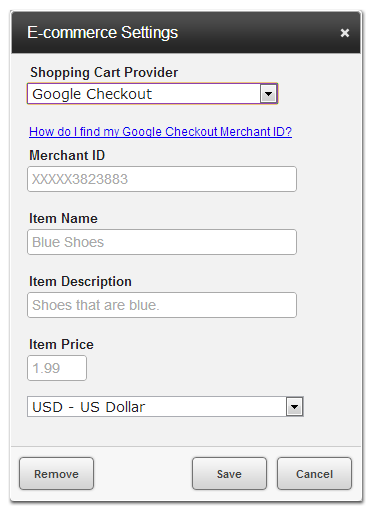 Merchant ID - A unique, numeric code that Google Checkout has assigned to your business. Item Name - The name of the product/service that you are providing. Item Description - A brief description of your product/service. Item Price - The selling price of your product or service. Currency - The currency that you wish to use. PayPal ID or Verified Email - The ID or verified PayPal email address that PayPal assigned to your business. Once published your visitors will be able to purchase your product or service that you have setup. Drag the OpenTable tile, , onto the stage to provide your mobile visitors a convenient way to reserve a table at your establishment. The OpenTable settings window appears. Fill out the fields that appear. OpenTable Restaurant ID - A unique code that OpenTable has assigned to your business. Country - The Country that your restaurant is located. 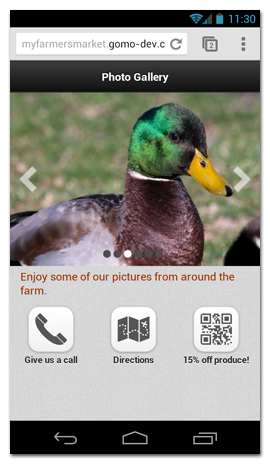 Once published your visitors will be able to reserve a table at your restaurant on their mobile or tablet device. 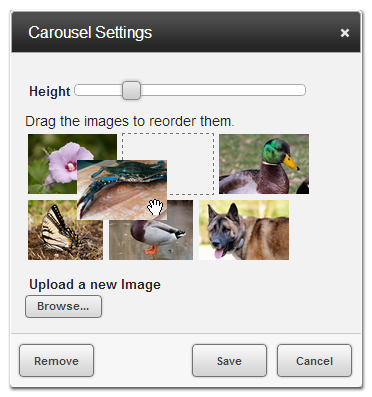 Drag the Image Carousel tile, , onto the stage to start the editing process. The editing dialog window appears. Click the Browse button to locate the images you would like to use. You upload one at a time. You can modify the Height of the images in your gallery by using the slider within the Carousel Settings dialog window. Tip: You will see the preview of your gallery change as you move the slider around. 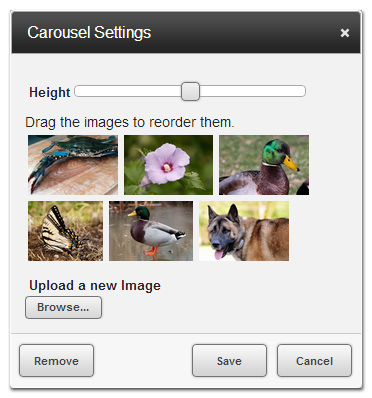 To reorder your gallery images, simply drag them to their desired location inside the Carousel Settings dialog window. Click the Browse button again to add as many images as are needed. Once you are done editing, click the Save button. After your site is published, the carousel gallery will be available to the mobile world. Visitors to your mobile site will be able to navigate the gallery with the right and left arrows, by swiping left and right or by tapping the circle icons a the bottom of your gallery. Yes, there is a NetObjects Mosaic Affiliate Program. You can sign up from the Mosaic home page. Look for the Become an Affiliate link in the footer. There is a minimum Payout Balance of $100.00 and for payments over $250.00 there is an additional review process in place. 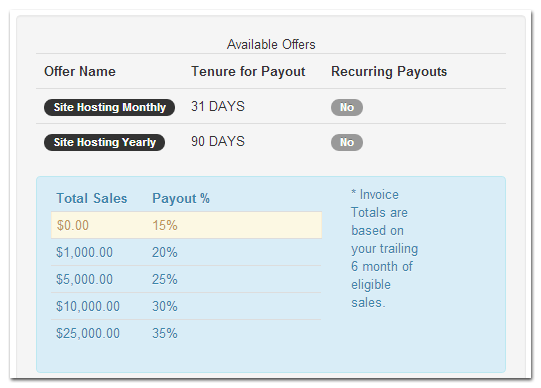 In addition to the above rules, monthly hosting conversions must have 31 days of tenure before revenue is eligible for payout. Annual is 90days. Affiliates get access to a portal where they can track signups, conversions, payouts, and projected future payouts. They can also generate affiliate links and signup widgets. Click here for further details. A quick breakdown of your conversions, commission earned and pending commissions. View your available payouts and reoccurring payouts from the Available Offers section. You'll also see what tier you're payments are currently in. You can generate referral codes or a sign up widget to place on your website. Referral codes contains a unique id that is connected to your account, letting us know that you sent the referral (so you get paid). There is also a referral link that is generated that you can give out to users or link to from your website (mobile or desktop). To add a new referral code, click the Add a Referral Code button. The Add a new Referral Code window appears. 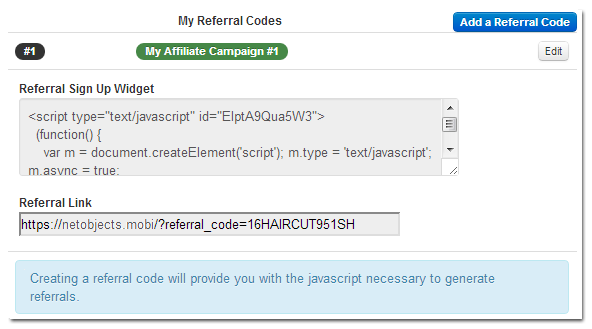 Provide a name for your new referral code, we've used My Affiliate Campaign #1 above. Click the Create Code button. Your new referral code and Sign Up Widget have been created. Dashboard - The affiliate portal dashboard. My Profile - A link to edit your account settings. Mosaic - A link to the Mosaic editor. Logout - Logs you out of Mosaic and the dashboard. The referral links that are generated can be used just as any other link. Give it out, put it in an email, etc. When you created your referral code, a small script for a Sign Up widget is also created. This widget can be placed on your website for visitors to sign up for their own account (with your unique ID). How to place the Sign Up Widget inside NetObjects Fusion? How to place the Sign Up Widget in my HTML? In either of the above scenarios you'll need to copy the Sign Up Widget code from the dashboard. You can do this by clicking inside the Referral Sign Up Widget code box. It will auto-highlight the entire code block for you. Right click the highlighted area and select Copy from the contextual menu (you can also click CTRL + C after it is highlighted). The code is now copied to your clipboard. Open your desktop website in NetObjects Fusion (any version) and navigate to the page you would like to widget to appear on. Draw a text box onto your page. 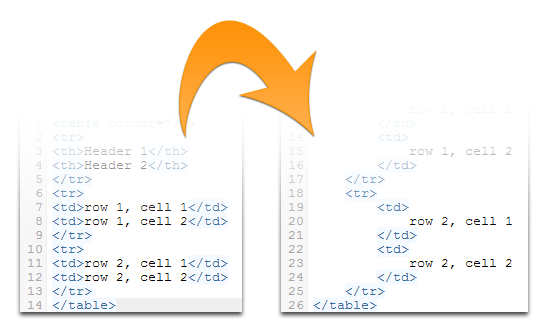 Click inside the text box and then click CTRL + T. The Insert HTML dialog window appears. Right click inside the dialog window and select Paste. Click OK and publish your website. The sign up widget is now live. 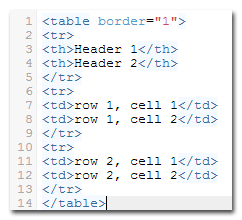 You can place the sign up widget HTML anywhere between the <body></body> tags in your HTML. A. NETOBJECTS GENERAL TERMS OF SERVICE. Thank you for choosing NetObjects Inc. (referred to as "NetObjects", "we", "our", or "us") for your website design software and services. Please review these Terms of Service ("Agreement") thoroughly. This Agreement is a legal agreement between you (referred to as "you", or "your") and NetObjects. By accessing or using the Services, you agree to these terms. If you do not agree to this Agreement, then do not use the Services. Additional Terms and Conditions for the Services that you have selected, including from third parties. Any terms provided separately to you for the Services, including for example, domain name registration terms, and ordering, activation, pricing and payment terms, if applicable, for the Services. 2. USE AND RESTRICTIONS. The Services are protected by copyright, trade secret, and other intellectual property laws. You are only granted the right to use the Services, and NetObjects reserves all rights of ownership in the Services not granted to you in writing here. As long as you meet any applicable payment obligations and comply with this Agreement, NetObjects grants to you a personal, limited, non exclusive, nontransferable right to use the Services that is valid only for the period of use provided in the ordering and activation terms, and only for the purposes described by NetObjects on the website for the Services. Reproduce, duplicate, copy, deconstruct, sell, trade or resell the Services. Attempt to access any other NetObjects systems that are not part of these Services. Excessively overload the NetObjects systems used to provide the Services. If you violate any of these terms, this Agreement and your right to use the Services may be immediately terminated by NetObjects in its sole discretion. Payments will be billed to you in U.S. dollars, and your account will be debited when you subscribe and provide your payment information. If your payment and registration information is not accurate, current, and complete and you do not notify us promptly when such information changes, we may suspend or terminate your account and refuse use of the Services. NetObjects will automatically renew your monthly or annual Services at the current rates, unless the Services are cancelled or terminated under this Agreement. 4. TRIAL. If you registered for a trial use of the Services ("Trial Period"), you must decide to purchase the Services within the Trial Period in order to retain any Content (defined in Section 6) that you have posted or uploaded during the Trial Period. If you do not purchase the Services by the end of the Trial Period, your Content will no longer be available to you. To be very clear, after using the Services during the trial period, if you decide not to purchase the full version of the Services, you will not be able to access or retrieve any of the data you added/created during the trial. NetObjects is a global company and may access or store personal information in multiple countries, including countries outside of the European Union that may be deemed to have inadequate protections. When you agree to these Terms of Service, you agree to this practice. You are responsible for your content. You are legally responsible for all information, data, text, music, sound, photographs, graphics, video, messages or other materials ("Content") uploaded, posted or stored through your use of the Services. You grant NetObjects a worldwide, royalty-free, non-exclusive license to host and use the Content in order to provide you with the Services. You agree not use the Services for any illegal purpose or in violation of any applicable local, state, federal or international law. You are responsible for any Content that may be lost or unrecoverable through your use of the Services. NetObjects is not responsible for the Content or data you submit on the website. Any Content, which is not legally yours and may be protected by copyright or other proprietary right, or derivative works, without permission from the copyright owner or intellectual property rights owner. NetObjects may monitor your content from time to time. NetObjects may, but has no obligation to, monitor content on the Services. We may disclose any information necessary or appropriate to satisfy our legal obligations, protect NetObjects or its customers, or operate the Services properly. NetObjects, in its sole discretion, may refuse to post, remove, or refuse to remove, any Content, in whole or in part, alleged to be unacceptable, undesirable, inappropriate, or in violation of this Agreement. You are responsible for securing your passwords. You are responsible for securely managing your password(s) for access to the Services. If you become aware of any unauthorized access to your Services account, theft or loss of your password, you agree to contact NetObjects as soon as possible. Illegal Sales. You agree not to sell, distribute, disseminate or link to any sites for marketing, sales, distribution of: firearms, explosives, ammunition, tobacco (including e-cigarettes), alcohol products as well as any products or services that (a) you cannot legally sell, (b) are misrepresented, and/or (c) if sold using the website design Services, could cause NetObjects or its affiliates to violate any law, statute or regulation. Services Management. You hereby acknowledge that NetObjects may, from time to time, establish limits concerning the use of the Services, including without limitation, (a) maximum limits on bandwidth usage, and (b) maximum limits on storage space, Any of the foregoing limits will be consistent with the Services for which you have registered. You agree that NetObjects has no responsibility or liability for the deletion or failure to store any content maintained or transmitted by the Services. You further acknowledge and agree that NetObjects reserves the right to change these limits at any time, in its sole discretion, with or without notice. Intellectual Property Rights. You warrant and represent that you own or otherwise control the rights to the Content and grant NetObjects a worldwide, royalty-free, non-exclusive license to (a) host, use, reproduce, modify, distribute, transmit, combine with information provided by third parties, and publicly display the Content on and through the Service and in promotional or advertising materials (only for the limited purpose of promoting the Services), and (b) sublicense to third parties such Content to the extent necessary for the creation and maintenance of, in part or in whole, such Services and materials. Copyright and Trademark Notices. All materials of the Service (as well as the organization, layout and function of the Services are owned and copyrighted or licensed by NetObjects, its affiliates or its suppliers. All rights reserved. No reproduction, distribution, or transmission of the copyrighted materials of the Services is permitted without the written permission of NetObjects. Any rights not expressly granted herein are reserved. NetObjects, netobjects.com, the NetObjects logo, SiteStyles, NetObjects Mosaic and other NetObjects logos and product and service names are trademarks of NetObjects Inc. (the "NetObjects Marks"). You agree not to display or use the NetObjects Marks in any manner whatsoever without NetObjects' prior permission. Notification of Claims of Copyright Infringement. Any notifications of claimed copyright infringement should be sent to mosaic@netobjects.com, with the subject "DMCA Request". Internet Domain Names. NetObjects contracts with ICANN accredited registrars to provide domain name registration services. You hereby authorize NetObjects, if requested, to transfer in or acquire your selected top-level domain name. NetObjects will be listed as the registrant and administrative contact in connection with the domain name. NetObjects or its affiliates, will list itself as the billing contact, technical contact and name servers in connection with the domain name and to take any actions NetObjects deems appropriate in those capacities. In the event that your account is suspended by NetObjects for lack of payment or any other reason, NetObjects shall not renew any domain names that may become due for renewal during the suspension of the account. Upon termination of the Service, you can elect to become the registrant and administrative contact of the domain name by paying NetObjects the applicable transfer fee(s). Upon termination of your account for any reason, NetObjects reserves the right to (a) collect all charges, fees, commitments and obligations incurred or accrued by you; (b) delete any of your Content or other information in connection with your Account; (c) prohibit your access to your Account, including without limitation by deactivating your password; and (d) refuse your future access to the Services. In no event shall NetObjects be required to refund, redeem, or pay amounts to you upon termination of Service or return any of your Content. 8. DISCLAIMER OF WARRANTIES. YOUR USE OF THE SERVICES AND CONTENT IS ENTIRELY AT YOUR OWN RISK. EXCEPT AS DESCRIBED IN THIS AGREEMENT, THE SERVICES ARE PROVIDED "AS IS." TO THE MAXIMUM EXTENT PERMITTED BY APPLICABLE LAW, NETOBJECTS, ITS AFFILIATES, AND ITS THIRD PARTY SERVICE OR DATA PROVIDERS, LICENSORS, DISTRIBUTORS OR SUPPLIERS (COLLECTIVELY REFERRED TO AS, "SUPPLIERS") DISCLAIM ALL WARRANTIES, EXPRESS OR IMPLIED, INCLUDING ANY WARRANTY THAT THE SERVICES ARE FIT FOR A PARTICULAR PURPOSE, TITLE, MERCHANTABILITY, DATA LOSS, NON-INTERFERENCE WITH OR NON-INFRINGEMENT OF ANY INTELLECTUAL PROPERTY RIGHTS, OR THE ACCURACY, RELIABILITY, QUALITY OR CONTENT IN OR LINKED TO THE SERVICES. NETOBJECTS AND ITS AFFILIATES AND SUPPLIERS DO NOT WARRANT THAT THE SERVICES ARE SECURE, FREE FROM BUGS, VIRUSES, INTERRUPTION, ERRORS, THEFT OR DESTRUCTION. IF THE EXCLUSIONS FOR IMPLIED WARRANTIES DO NOT APPLY TO YOU, ANY IMPLIED WARRANTIES ARE LIMITED TO 30 DAYS FROM THE DATE OF PURCHASE OR DELIVERY OF THE SERVICES, WHICHEVER IS SOONER. 9. LIMITATION OF LIABILITY AND INDEMNITY. TO THE MAXIMUM EXTENT PERMITTED BY APPLICABLE LAW, THE ENTIRE LIABILITY OF NETOBJECTS, AND ITS AFFILIATES AND SUPPLIERS FOR ALL MATTERS OR CLAIMS RELATING TO THIS AGREEMENT SHALL BE LIMITED TO THE AMOUNT YOU PAID FOR THE SERVICES DURING THE TWELVE (12) MONTHS PRIOR TO SUCH CLAIM. SUBJECT TO APPLICABLE LAW, NETOBJECTS AND ITS AFFILIATES AND SUPPLIERS ARE NOT LIABLE FOR ANY OF THE FOLLOWING: (A) INDIRECT, SPECIAL, INCIDENTAL, PUNITIVE OR CONSEQUENTIAL DAMAGES; (B) DAMAGES RELATING TO FAILURES OF TELECOMMUNICATIONS, THE INTERNET, ELECTRONIC COMMUNICATIONS, CORRUPTION, SECURITY, LOSS OR THEFT OF DATA, VIRUSES, SPYWARE, LOSS OF BUSINESS, REVENUE, PROFITS OR INVESTMENT, OR USE OF SOFTWARE OR HARDWARE THAT DOES NOT MEET NETOBJECTS SYSTEMS REQUIREMENTS. THE ABOVE LIMITATIONS APPLY EVEN IF NETOBJECTS AND ITS AFFILIATES AND SUPPLIERS HAVE BEEN ADVISED OF THE POSSIBILITY OF SUCH DAMAGES. THIS AGREEMENT SETS FORTH THE ENTIRE LIABILITY OF NETOBJECTS, ITS AFFILIATES AND YOUR EXCLUSIVE REMEDY WITH RESPECT TO THE SERVICES AND ITS USE. You agree to indemnify and hold NetObjects and its Affiliates and Suppliers harmless from any and all claims, liability and expenses, including reasonable attorneys' fees and costs, arising out of your use of the Services or breach of this Agreement (collectively referred to as "Claims"). NetObjects reserves the right, in its sole discretion and at its own expense, to assume the exclusive defense and control of any Claims. You agree to reasonably cooperate as requested by NetObjects in the defense of any Claims. 10. CHANGES TO THIS AGREEMENT OR THE SERVICES. We may change this Agreement from time to time, and the changes will be effective when posted on our website. Please review the Agreement periodically for changes. We may also change or discontinue the Services, in whole or in part, including but not limited to, the services, pricing, technical support options, and other product-related policies. Your continued use of the Services after NetObjects posts any changes, indicates your agreement to the changes. 11. TERMINATION. NetObjects may immediately and without notice terminate this Agreement, or suspend the Services provided to you, if you fail to comply with these terms. Upon termination you must immediately stop using the Services and any outstanding payments will become due. Any termination of this Agreement shall not affect NetObjects' rights to any payments due to it. NetObjects may terminate a free or trial account at any time. Other requirements regarding termination or cancellation of the Services may apply based on the specific ordering terms for the Services provided to you. Sections 5, and 8 through 15 will survive and remain in effect even if the Agreement is terminated, cancelled or rescinded. 12. EXPORT RESTRICTIONS. You acknowledge that this website, the Services, and the underlying software may include U.S. technical data subject to restrictions under export control laws and regulations administered by the United States government. You agree that you will comply with these laws and regulations, and will not export or re-export the Services, or any part of the Services, in violation of these laws and regulations, directly or indirectly. You also agree not to provide access to any part of the Services to anyone who you have reason to know may use the Services in the development of nuclear, chemical, or biological weapons. 13. GOVERNING LAW AND JURISDICTION. This Agreement shall be interpreted in accordance with the laws of the Commonwealth of Pennsylvania without regard to its choice of laws rules. To resolve any legal dispute arising from this Agreement, you and NetObjects agree to the exclusive jurisdiction of the courts of the Commonwealth of Pennsylvania. NetObjects does not represent that information on the website for the Services is appropriate or available for use in all countries. NetObjects prohibits accessing materials from countries or states where the contents are illegal. You are accessing this website on your own initiative and you are responsible for compliance with all applicable laws. 14. LANGUAGE. Any translation of this Agreement is done for local requirements and in the event of a dispute between the English and any non-English version; the English version of this Agreement shall govern. The parties hereby confirm that they have requested that this Agreement and all related documents be drafted in English. 15. GENERAL. This Agreement is the entire agreement between you and NetObjects and replaces all prior understandings, communications and agreements, oral or written, regarding its subject matter. This Agreement may be modified only by a written amendment signed by the parties or as provided in this Agreement in Section 10 above. If any court of law, having jurisdiction, rules that any part of this Agreement is invalid, that section will be removed without affecting the remainder of the Agreement. The remaining terms will be valid and enforceable. The United Nations Convention on Contracts for the International Sale of Goods does not apply to this Agreement. You cannot assign or transfer ownership of this Agreement to anyone without the prior written approval of NetObjects. However, NetObjects may assign or transfer it without your consent to (a) an Affiliate, (b) another company through a sale of assets by NetObjects or (c) a successor by merger. Any assignment in violation of this Section shall be void.